Groupize powers some of the world’s largest meeting planning organizations and travel management companies and their customers including Fortune 10 and Fortune 500 companies, as well as all aspects of sports travel. That’s amazing to find 100 more meetings in our customer's program to bring into visibility for Travel & Transport. We have access to so many people at Groupize and the support for the implementation and program has been invaluable! "this is so awesome", "...we are so excited - this is so much better than doing everything by hand". "Really appreciate the hand-holding". This strategic partnership with Groupize advances Gant Travel’s offering and enables us to provide our small and medium business clients with tools that were out of reach until now. Groupize Meetings is a natural extension of our Concur strategy with our customers. 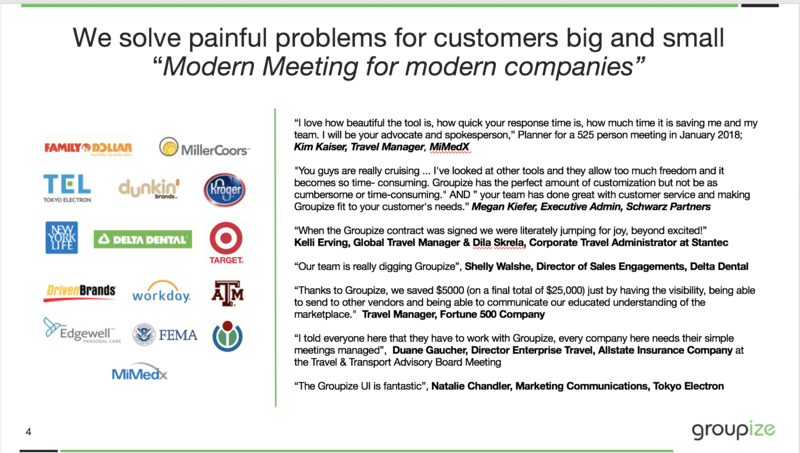 The Groupize Meetings disruptive pricing model makes these tools accessible to all of our clients.